Ambiance Interiors & Gifts is a nationally acclaimed interior designer and gift boutique in Suwanee, Georgia. The client has a very small web site that members of the company created in-house but it lacks the quality and depth of a professionally designed web site. They are busy running their own business and recognize the value of professional help with their web site. They want their web site to show their business in the level of class and creativity that reflects their extensive work. Design and develop a new web site that portrays the client&apos;s national renowned success in the world of interior design. 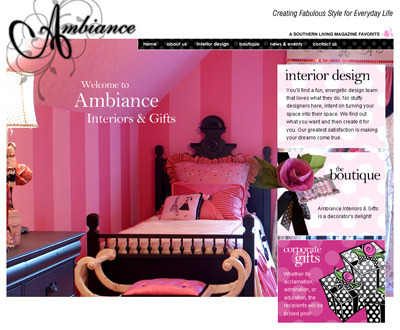 Create a new web site with Ambiance Interiors &amp; Gifts artsy flair. The company logo and all of their branding uses a bold pink, black and white polka-dot motif. They want "WOW" kind of results in the design. The new web site needs to convey that the client is nationally recognized and awarded and be capable of publishing and staying current with recognition that they receive. The client is speaking at a major trade convention and needs the web site to be up before the convention. XI Interactive created a beautiful web site featuring photography on every page, lots of white-space so the design can make a statement. The design has a magazine kind of look to it in order to flow well in the world of interior design. The web site is developed with search engine optimization (SEO) features in mind. All meta tagging is accomplished dynamically resulting in ease of maintenance. An "In The News" database is created in order to publish and maintain information regarding the many articles and press releases that pertain to Ambiance Interiors &amp; Gifts that are written in many trade publications. Events calendaring is also placed in a database for ease of maintenance and consistent publishing quality. Navigation is developed in Flash/XML and can be modified easily as pages are added and the site grows and changes. The client loves the design and the way it portrays their branding. The site was up in time for her convention and she was able to include her experience of developing her web site in her speech, specifically of how important it is to create consistent branding in all of a design firm&apos;s corporate collateral.